Rohit Kulkarni obtained his MD and PHD degrees from St. John’s Medical College and the Royal Postgraduate Medical School in London where he trained in the lab of Steve Bloom. Subsequently, he obtained the NIH NRSA Award and completed a Postdoctoral Fellowship in the lab of Ron Kahn at the Joslin Diabetes Center. 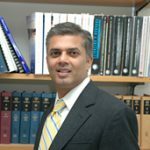 He has been on the Faculty of the Joslin Diabetes Center since 1999 and is currently a Senior Investigator and Associate Professor of Medicine at Harvard Medical School. He is the recipient of the Endocrine Society’s Ernst Oppenheimer Award, the Merck Frosst Distinguished Lectureship and James H. Horner Distinguished Visiting Professorship and is an elected member of the American Society for Clinical Investigation and Association of American Physicians.